Therese Crossan Year 13 compered the Volunteer Now ‘Awards of Excellence’ Ceremony on the 2 March 2017 in Belfast City Hall. 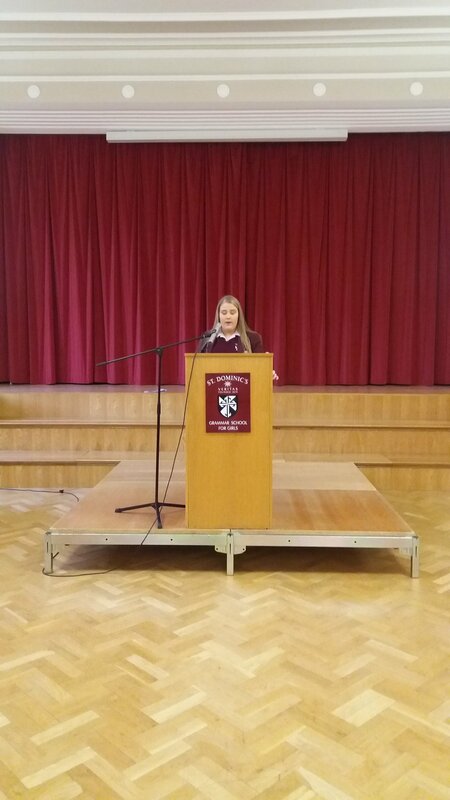 As an #iWill Ambassador Therese was invited to compere this event, a brave undertaking speaking to several hundred young volunteers and their invited guests. Also present at the event was Katie McNally (a Year 10 pupil) who was acknowledged for her outstanding volunteer commitment. Katie has contributed more than 200 hours of voluntary service to her local community, Therese herself would have attended a similar Awards of Excellence event as a participant. Here we see Katie receiving her award on the night. Congratulations to both students on their volunteering efforts and achievement. The A2 Drama and Theatre Studies practical exam took place on Thursday 3rd March and all the students performed exceptionally well. Well done! Year 8 and Year 9 pupils will be competing in Science completions next week to mark Science week. Year 8’s will be participating in “The paper plane challenge” and the Year 9’s will be participating in the “Helicopter Challenge”. The pupils will compete in their classes and the winner from each class will compete against each other. Winners will receive a certificate and a voucher. The event will be coordinated by the following Year 13 Science pupils, Nicole Beattie, Patrice Relf, Amy Wilkinson, Megan Wilkinson, and Lauren Mervyn. Taking part in the 2016 Citizenship Foundation Mock Bar Trials as a court reporter was great experience and insight into the role of court journalism. On the day of the competition in Belfast Royal Courts of Justice, as court reporter I observed the St. Dominic’s team trials for Case one and two, writing notes on definitive moments of each trial and afterward a full newspaper-style article. The competition was a brilliant opportunity for me to get involved in both law and journalism. Bad hearing, blood and battery! A young builder from Everytown has been convicted of assault at the Royal Courts of Justice in Belfast, following a row with a neighbour on Washington Road. The assault took place on 1st June 2016 after Toni Williams confronted her neighbour, Alex Edwards, about the volume of music being played, resulting in Edwards allegedly becoming violent. Edwards claims that on the night of 1st June, she and friend Robin Goodly were listening to music and drinking some beers. Edwards alleges that due to hearing difficulties resulting from her job as a builder the volume of music “could be perceived as high”. Witness to the crime, 65 year old neighbour Ronny Childs, stated that Edwards always struck him as “a bit rough looking”, and Williams as “very nice and respectable”. At around 10pm, Williams stepped out to confront Edwards about the volume of the music, as Edwards was leaving her home to purchase more beers for her and Goodly, who Edwards described as “a bit drunk”. Childs described Edwards as the aggressor of the situation, and that he heard Edward’s voice shouting aggressively before he saw Edwards punch Williams in the face. Police Constable Stamp, who responded to a 999 call made by Goodly, reported that William’s face was “bruised and covered in blood which seemed to be coming from her nose”. Edwards claimed that the assault was an act of self-defence, a reflex action as Williams was advancing toward her, allegedly screaming threateningly before spitting at her. Goodly, who witnessed the event, said that Edwards was “just acting instinctively”. During the closing speech, Prosecution barrister Muireann Kearney urged both the judges and jury to see past Goodly’s “boozy smokescreen”. After a short deliberation the jury announced that they found the defendant Alex Edwards guilty of assault causing actual bodily harm. The British Education Awards (BEA) were established to promote excellence in education. Open to all students across the UK, these awards identify and celebrate individuals who have excelled within the education system. As the Northern Ireland Finalist, Shusma’s award acknowledges that success comes down to personal endeavour and application, an incredible achievement on her part. She attended the awards ceremony with her proud parents in the Grand Connaught Rooms in London on 30th January. St Dominic’s Grammar School for Girls are delighted with Shusma’s achievement but they are not entirely surprised. The Principal of St Dominic’s, Mrs Carol Mc Cann nominated Shusma for the award and acknowledged that she is thoroughly deserving of it. The school has always had full faith in Shusma who is an extremely enterprising and able young woman. Indeed, whilst at school, she availed of every opportunity to improve and prepare herself for a future career in electronic engineering. She is currently studying at Cambridge University and it is no surprise that she is also the winner of the IET Diamond Jubilee Scholarship for 2016. Shusma is no stranger to success. In 2015, whilst at school, she was awarded the IET IngeNious Female Award. Additionally, she was awarded an Arkwright Engineering Scholarship and received sponsorship by Shrader Electronics. The latter also led to an internship with the company. Through the GETSET Engineering for Girls programme, she gained an internship with Caterpillar. Acquiring a NUFFIELD Bursary led to work experience with Northern Ireland Electricity where she had the opportunity to visit wind farms, work at substations and visit the Distribution Control Centre. 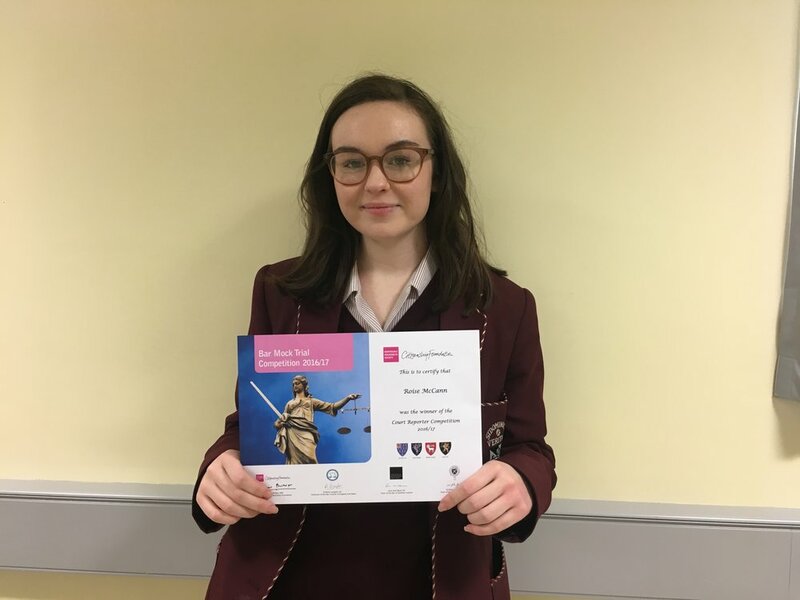 She also attended the Computer and Space Camps at the University of Ulster Through attendance at the Computer Camp; she had the opportunity to learn coding and VB Script. The Space Camp provided her with an insight into astrophysics. Following on from excellent GCSE level results, Shusma was also chosen to represent the school on the Higher Education + programme which has been set up by Cambridge University to nurture gifted and talented students and encourage them to apply for a place at Oxbridge. Shusma fulfilled her dream when she achieved a place at Cambridge University. Shusma joined St Dominic’s in Year 8 as a fresh-faced, eager young girl, having arrived directly from India. From her early days, she threw herself enthusiastically into the life of the school. She was extremely popular with both staff and pupils. Despite having English as a second language, it was evident immediately that Shusma had the drive and ambition to achieve her goals and at the same time, she remained grounded, humble, kind and warm. This gained her the respect of the whole school community and no-one was ever surprised to hear that Shusma had won yet another award. Coming from India at the age of 11, she did not allow her initial difficulties with English to hold her back and indeed she was the highest achiever in the school in many of her subjects at GCSE and also at A Level. Shusma remains an inspiration to all young women and both her family and her school are immensely proud of her great success. 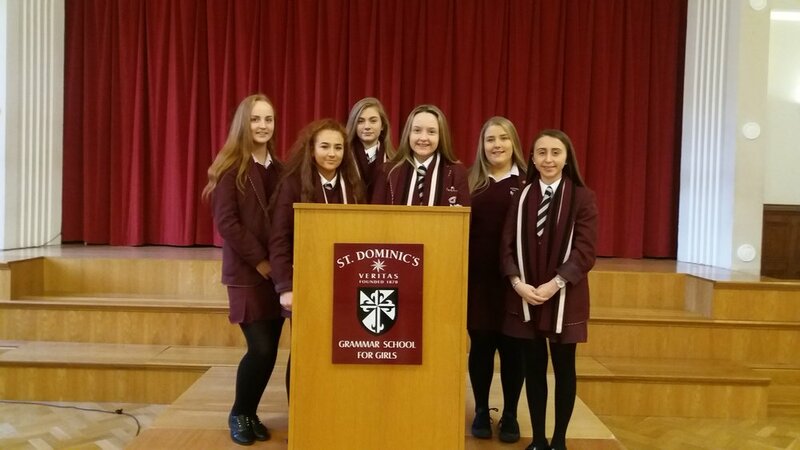 The girls had to learn a speech between 3-4 minutes long in Irish and deliver it in front of a panel of judges and competitors from other schools. They all spoke very well. 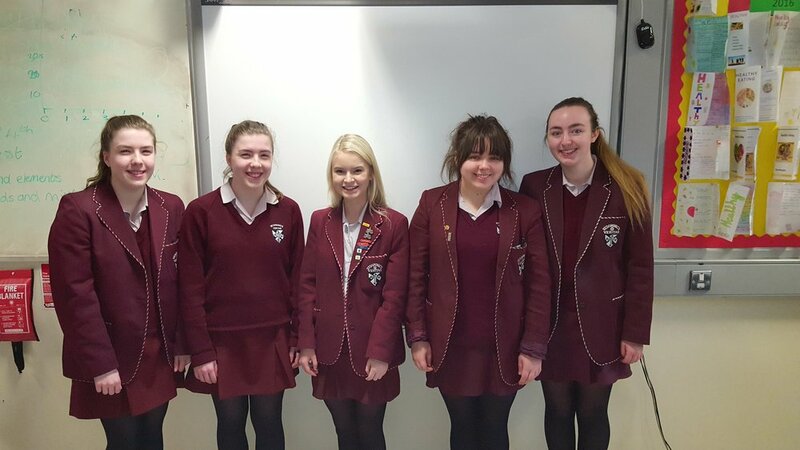 Special congratulations to Niamh McNally who was placed first in the GCSE Level category, and to Córa Weir who was placed second in the A Level category. They will now prepare to take part in the final in the coming weeks. Congratulations to the Junior Basketball Team on competing in their first Basketball tournament for St. Dominic's. The team consisting of 3 year 9 students and 8 year 10 students. They played well and gained valuable experience of playing competitive matches. MVP of the tournament for St. Dominic's was awarded to Lucy Murray. Well done to all. Congratulations to Michelle Magee who was part of the winning Ulster Schools All Star team who won the All Ireland competition on Saturday 21st January in Mullingar. Ulster beat Connacht 2.07 v 1.01 to become the champions. This is the first time Ulster has won the competition. Michelle played in midfield for all games and still managed to score a few goals. Congratulations on your first All-Ireland title.